With the more prominent Russian presence in the war the tables have turned for the U.S. narrative so I'm going to be taking a break from my #elxn42 breakdown series to refocus on the war in Syria as it's now at a pivotal point. Recently 60 Minutes did an interview with Putin which I would really encourage you to watch. Putin is succinct and clear with his answers despite 60 Minutes' obviously pointed questions. Of course Russia is "up to something", we're all "up to something" in this region with everyone using humanitarianism and ISIS as a cover. But the Russian strategy (which we will be discussing throughout this post) is quite clever. Why now? What are the Russians really up to? A big question on everyone's minds seems to be. Why now? What are the Russians really up to? As Kunstler rightly notes the official narrative so far has more or less been that they are "Russia has involved itself in Syria only to aggrandize its role on in world affairs". Of course they're there to fortify Assad and prevent what I must remind you is the sovereign government of Syria from being overrun by U.S. empire backed terrorists. But based on their actions there is clearly a lot more to it than that. It's of course suspected (obvious really) that should the official U.S. 'moderate' rebels attack the SAA they will be fair game but they are also taking this opportunity to reinforce the Syrian government against NATO itself. Vladimir Putin has reportedly added drones, attack helicopters and aircraft to its force in Syria in recent weeks. Russia rapidly increased its aerial attack capabilities in Syria over the weekend, U.S. officials told Agence France-Presse on Monday, including 28 combat planes that have been sighted at a new Russian air base in the Syrian province of Latakia. The fleet includes 12 SU-24 attack aircraft, 12 SU-25 ground attack aircraft and four Flanker fighter jets, the officials told the news agency on condition of anonymity. An influx of new weaponry was also reported separately by the New York Times and CNN. One of the officials told AFP of the additional presence of around 20 combat helicopters and said Russian forces are flying surveillance drones over the Middle Eastern nation’s airspace. According to the Times, Russia’s military presence in Syria also includes at least three surface-to-air missiles, nine tanks and around 500 marines. So why recent weeks? Let's take a look at some of the headlines from 'recent weeks'. On September 18th a "special representative to the United States and the United Nations for the Syrian National Coalition." wrote an op-ed in the New York Times calling for a No-Fly Zone. On August 28th in the Globe & Mail: "The time for a ‘no-fly zone’ over Syria has arrived"
Yesterday, September 28th "Kevin McCarthy calls for no-fly zone over Syria"
The U.S. flew “no-fly zones” over northern and southern Iraq for more than a decade before the 2003 U.S. invasion that toppled Saddam Hussein. U.S. warplanes kept Iraqi aircraft out of the sky, and targeted Iraqi air-defense systems that threatened to shoot. Now, along with neighboring Turkey, the U.S. is planning to launch something similar over a stretch of northern Syria. Now of course the other hand of the U.S. immediately "shot down" this idea but you'd have to be an idiot to actually believe it's not being considered and I don't think Putin is an idiot, do you? I read a great blog post on the type of system Putin is deploying which I really suggest you check out. In part 2 of my series on the Canadian federal election we took a trip down memory lane on some of the events that lead to the Syrian 'civil' war. Since the Russian build up the western narrative on Syria has changed significantly almost overnight. Russia is forming it's own coalition to fight ISIS - and it is legal and operating within Syria at the invitation of the Syrian government. As the Financial Times noted "this puts the U.S. on the back foot". If you'll recall from part 2 of my series on the Canadian election, prior to John Kerry failing to convince the world of the urgent need to bomb the Syrian government there was no ISIS narrative in the news, it was all "rebels" with sprinkles of al-Qaeda. The al-Qaeda participation was downplayed and frankly I don't think the public was ever supposed to know about their participation. Syria was supposed to go down like Libya where hardly any of the population was aware of the fact the rebels were actually mostly terrorists. If you remember the media atmosphere back then it was largely the public's recent awareness to the presence of al-Qaeda within the rebels that made it so difficult for the United States to get a coalition and public mandate to bomb the Syrian government. There was too much doubt about the still dubious 'chemical weapons' which were presented to strengthen the argument given the presence of al-Qaeda. It was only following Kerry's failure to bomb Assad that the media latched onto the phrase ISIS. The necessity of the change in focus and narrative can not be understated. 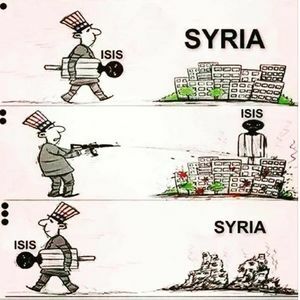 The United States can not invoke the 'War on Terror' to attack a sovereign state. They need a reason, they need public support. They tried to get it, and failed. However, the 'War on Terror' allows them to attack terrorists anywhere in the world regardless of borders. They got their bombing of Syria, and they got it by instead of hiding the presence of al-Qaeda - and their atrocities as "the rebels" - moving to a strategy that highlighted them. The heinous acts of ISIS coupled with some likely propaganda aided by intelligence for media purposes were finally enough to gain support for limited military action in Iraq and Syria. The narrative changed and in what seemed almost overnight there wasn't just a few terrorist fighters, there were tons, and now they terrorize 60% of Syria. It really is a testament to the awesome power of manipulation that exists within the military industrial complex. This narrative has a weakness however, and now for the second time Russia has seized on the weakness in the U.S. narrative to deny them what they want. The first time in 2013 when Kerry occidentally provided a direct path for Russia to follow that would thwart the U.S. attack that the U.S. had to honour to save face and now this time by using their "ineffective" war against ISIS as the same pretext for their fortification of the Syrian state which much like the U.S. being able to strike the Syrian government directly would raise suspicion if not for the convenient excuse of ISIS. Russia is beating the U.S. at it's own game of public relations. The rhetoric now has greatly changed because the U.S. is trapped in their own ISIS narrative. The hopes for a no-fly zone necessary in the NATO strategy for regime change is now extremely unlikely to occur without a direct confrontation with Russian hardware. The cover for the 'moderate' rebels (which if you remember from part 2 of my series on the Canadian election Joe Biden said "there are no moderate rebels") is now useless as Russia is within every legal right internationally to aid Syria. Russia is playing the situation by the book, using the same humanitarian crisis excuse that the U.S. has been using to enter Syria to begin a real fight against ISIS which the U.S. and it's coalition has not truly been doing. They have been working to contain ISIS and force Assad from power for their benefit causing untold grief on the people of Syria for as long as Syria doesn't play ball. The U.S. has repeatedly warned that Russia's entry into the war will prolong the war but the conflated reasoning for this is simple: the western proxy will not stop fighting until the U.S. and it's allies get what they want. In response to the Russian fortification now Saudi Arabia has warned that they may get directly involved in the conflict against the Syrian government and there are rumours of Chinese involvement in defence of the Syrian government too. Things are definitely heating up and it seems the U.S. is quickly losing control both of it's humanitarian shield narrative, and it's allies. The Russian airstrikes targeted positions, vehicles and warehouses that Moscow believes belong to IS militants, Russian Defence Ministry spokesman Igor Konashenkov told Russian news agencies. Given its 20 million Muslims, Russia, acting alone, is making a grievous mistake by assuming domestic immunity from the MidEast conflict. Seems like Russia's response is: challenge accepted. I've been trying for some time now to stay away from all the spin & hype opting to write as fact/truth based as possible- too much hype is to emotionally enthralling and I don't want to feel a hostage to this type of manipulation.